The last article considered the range of alternative legacy lenses one can adapt to the Olympus/Panasonic Micro Four Thirds (MFT) system. My goal is to find something more compact than my Pentax 43mm Limited without giving up anything significant in terms of image quality. In this article I'll use photographs to compare lenses designed for three different mounts, seeing how they look on the Olympus E-P1, and also crunching the figures to see which ends up winning the "I'm tiny! Buy me!" award. As a base-line I present the "Panasonic Lumix G Vario 20mm f/1.7 ASPH". It's widely considered the best lens of the current crop of auto-focus MFT lenses, with excellent image quality. Certainly I cannot fault it, although the equivalent normal field of view is not my favourite. I prefer either something wider or tighter, hence my consideration of lenses with about half the field of view. Because the element takes up less than half the radius of the front surface I have not bothered with a lens hood (though perhaps I should) and instead suffice with a small 26mm extension ring. Though you can see it in the photos, I removed it before measuring the following figures. The lens weighs a 100g and is 26mm long. 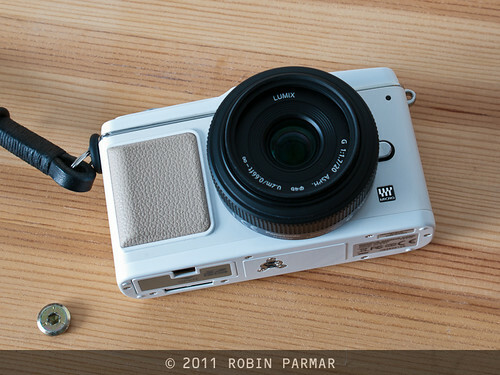 As you can see it makes a nice compact unit with the camera. It is perhaps unfair to compare it to the other focal lengths present here, but as I do not have a 40mm lens in MFT, it will have to do. After all, I am only using it as some sort of a baseline. I do wonder why this lens has to be so wide. It's not as comfortable to use nor as petite as it needs to be, optically speaking. Why should the auto-focus mechanism take up so much room? Nonetheless, the lens is remarkably short, which is a more important factor when considering how much space the camera takes up in a bag. Since I am well equipped with excellent Pentax prime lenses, the first adapter I obtained for my MFT system was K-mount. There is no better lens to shoot than the "SMC Pentax-FA 43mm F1.9 Limited", as I discussed at length in previous articles. Alone the lens is 155g and 27mm long, but the adapter doubles that size, since it needs to make up the 26mm difference in registers. The lens is pictured here with its hood, but I removed it to make comparisons fairer. The weight and length of the lens plus adapter are then 240g and 53mm respectively. As you can see from the photos the advantage of having a flat camera body is rather lost when the lens sticks out an equal distance. I often feel that I may as well be shooting my DSLR, since I need a shoulder bag for either camera. It's not as though this combination is going to fit in a pocket! 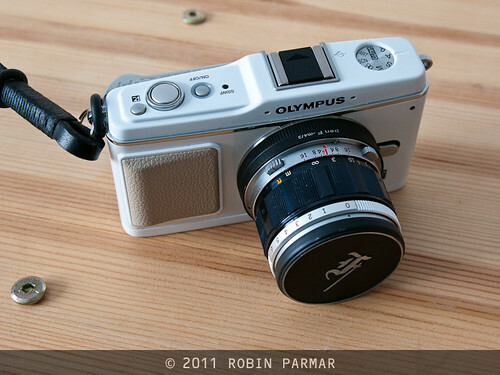 The "G. Zuiko Auto-S 40mm F1.4" was created for the Olympus PEN F half-frame film cameras. I don't yet have an appropriate hood. Without the push-on cap it is 165g and 37mm long. The required adapter is only 9mm deep, so the total length comes to 46mm, with weight 220g. 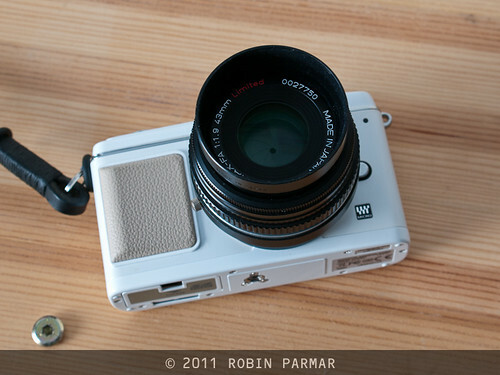 I'll be writing more about this lens, and showing you sample photos, in the near future. The Zuiko is certainly the thinnest of these three options, without the bulge in the adapter needed to accommodate the full-frame Pentax glass. 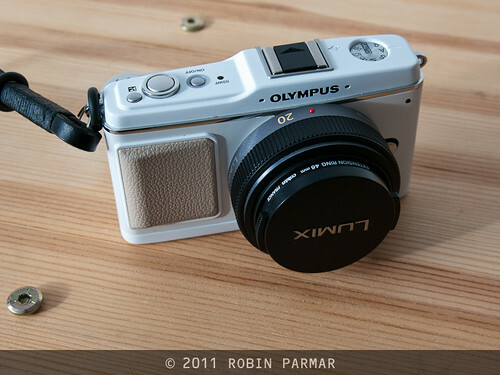 It has a certain elegance as a result, even if the styling of the lens is, in my opinion, nothing too special. 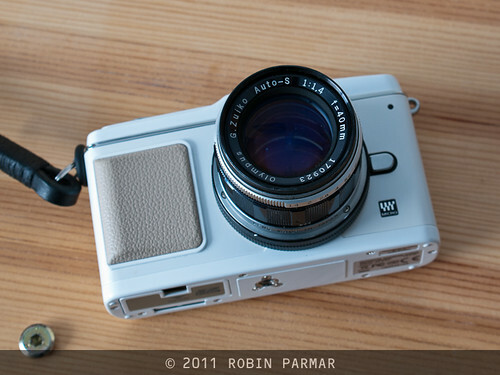 I had thought the Pentax lens to be over-sized on this camera, but the Zuiko in fact only saves me 7mm. Once I attach a suitable lens hood to each, I wonder if there will be a significant difference? Of course form factor is only one part of the equation. If the Zuiko optics can't cut the mustard next to the Pentax then I wouldn't want to use it. And since I consider the FA 43 Limited to be the finest lens I own, the challenger has a lot to live up to! Stay tuned for the next instalment. P.S. I realise that one reason I don't like using the FA 43 Limited is that it does not lock into place properly on the adapter. It is easy to rotate it right off the camera. This is not a problem with older Pentax lenses I have used with the same adapter. And the PEN F lens locks into place firmly. So perhaps if I sourced a different K-mount to MFT adapter it would sort me out. 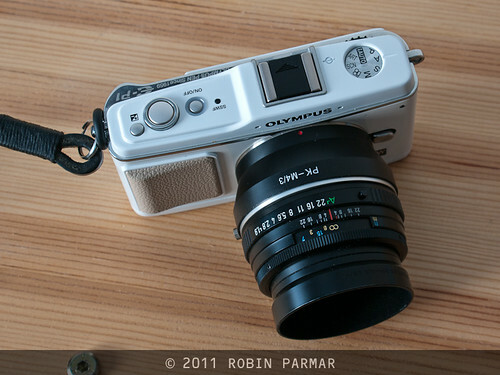 Any recommendations from readers who have used this particular Limited lens on MFT?